1 What is GoDaddy Hosting? 8 Summary and Conclusion: Is GoDaddy worth the money? You’ve probably seen GoDaddy’s Super Bowl commercials or heard about them from a friend. When it comes to domain registration and websites hosting, GoDaddy is certainly a big name. However, a big name is not enough to decide if the web host is for you. You need to do adequate research to find out if it suits your need and budget. This GoDaddy reviews will provide you a complete and honest review of GoDaddy’s hosting and domain services. GoDaddy is one of the oldest and largest domain registrars on the internet. It is also the number one web hosting company in North America in terms of market share. GoDaddy is among the pioneers of domain registration in 2001 after Network Solutions. The company became famous mainly from its popular Super Bowl commercials and celebrity spokespeople. Over the years, GoDaddy has attracted a huge number of clients. Currently, it has over 17 million customers and employs over 4000 people. In 2013, Blake Irving took over as the new CEO of GoDaddy and the company is experiencing some turn in the right direction since then. 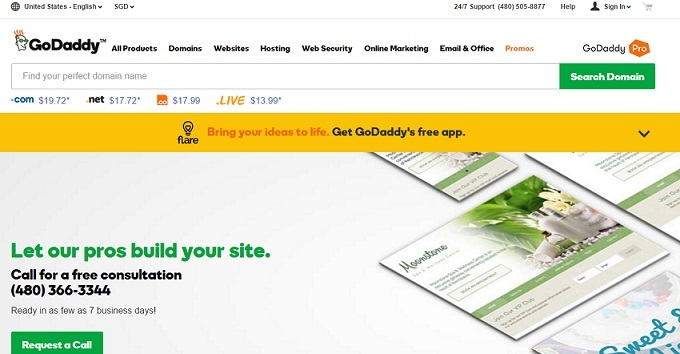 Overall, GoDaddy is a good web host and even a better domain registrar. They are stable, trusted and provide top quality services. It’s incredibly easy to sign up with GoDaddy. You will find detailed step by step instructions when you want to purchase a domain name or hosting plan from GoDaddy. It is more popular with domain registration services. Transferring to GoDaddy is so easy, you will find a tutorial that will help you to point your domain NameServers to GoDaddy’s server. 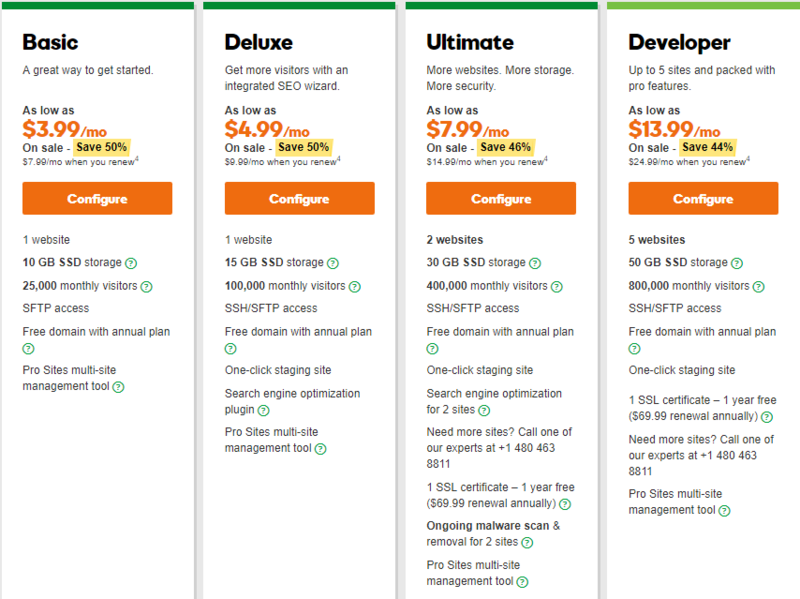 GoDaddy’s “Economy” plan is perfect for a basic personal website that doesn’t require much traffic. It can only host one website, the only difference between this plan and “Deluxe” plan is that you can host unlimited domains on Deluxe. The “Ultimate” plan offers more security with Premium DNS management tool. It comes with one year SSL Certificate. GoDaddy offers VPS hosting which centered majorly on Linux or Windows operating system. There are various prices depending on your needs. The basic price is $16.99/month for 1GB RAM Linux hosting. They also support other plans for those that need bigger RAM space. The GoDaddy Windows VPS hosting starts at $26.99 per month, with 2GB RAM, 40 GB storage, and unlimited bandwidth included. They have recently introduced reseller program. 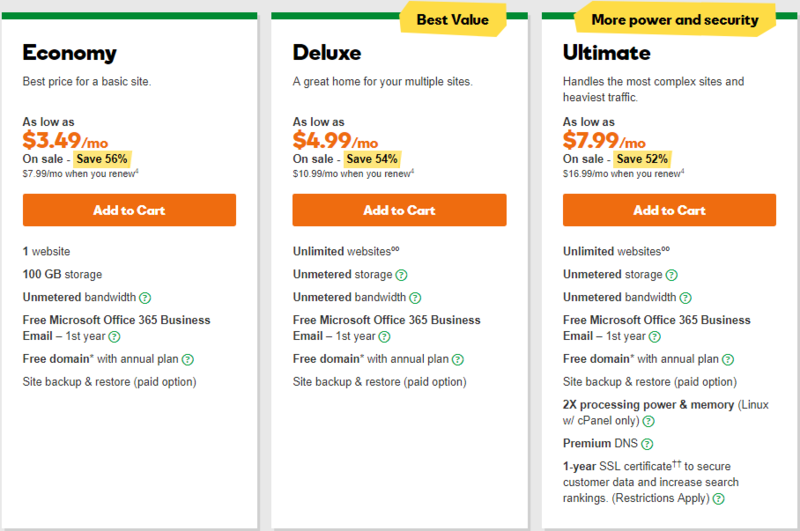 Individuals can now join GoDaddy’s reseller program and get a wholesale pricing of up to 40% off. Reseller package is divided into two categories: Basic Reseller and Pro reseller. Basic reseller starts from $8.99/month while PRO Reseller cost $14.99/month. Each of the plans comes with 24/7 support, credit card processing capability, white-label eCommerce storefront, sales and commission reports, and Standard buy rates. GoDaddy provides dedicated hosting for websites with huge traffic demands. They have both Linux and Windows plans for the dedicated hosting. Pricing table below shows the comprehensive package for the dedicated hosting. The Windows based dedicated hosting solution is more expensive than the Linux-based platform. It starts at $99.99 per month. Please take note the renewal price is $199.99 per month as the 50% off cannot apply for renewal. One unique thing we discovered about GoDaddy is that they give you the option to start up your own online store completely hands-free. The online store plan has one month trial and costs $29.99/month afterward. The price seems fair considering the value that comes with it. When you purchase this plan, you will have a website builder to set up your sites easily with built-in payment processing. GoDaddy allows you to cancel any package anytime you want. They offer a 45-day full refund for all their services except domain name registrations. Most plans come with a free one-year domain name. However, they will charge you for it if you cancel during the year. GoDaddy provides a great budget plan for WordPress Hosting. They will help you handle the setup and the management of your WordPress website when you purchase this plan. All WordPress plans come with a free domain name, 99.9% uptime guarantee, free support, a one-click migration tool, free daily backups and 1-click restore. Besides, it also allows you access to 1000 of free themes and plugin, automatic WordPress core software and security updates. The WordPress Plans are divided into Basic ($3.99/month), Deluxe ($4.99/month), Ultimate ($7.99/month) and Developer ($13.99/month). We recommend GoDaddy’s WordPress hosting which comes at affordable price. GoDaddy offers support in various languages. According to the company, they have about 500 in-house developers and more than 3,300 employees in various capacities. Customers can always get support from the phone, email, and social media. We find out that their live chat feature is also good. They provide local support for customers in United States, Canada, Australia, France, Germany, Italy, UK, Spain, and Netherlands. GoDaddy has a forum where you can learn from other customers and their support. There are also knowledge base and video tutorials that cover solution to almost all the problem a customer might encounter. If you are looking for a web hosting company that provides excellent customer support, then we would suggest you GoDaddy. I heard about the outstanding and fast customer support of GoDaddy. So I planned to check it by my own and I contacted their live chat customer support. Within 01.39 second their support person responded to me and I was really astonished. The person who talked with me named as Adam and he answered my all queries in a polite and professional way. I am really impressed with his rapid response. Because of his prodigious behavior and complete knowledge about GoDaddy hosting plans, I rated him 10 out of 10. Adam: Thank you for chatting with us My name is Adam. Who am I speaking with today? 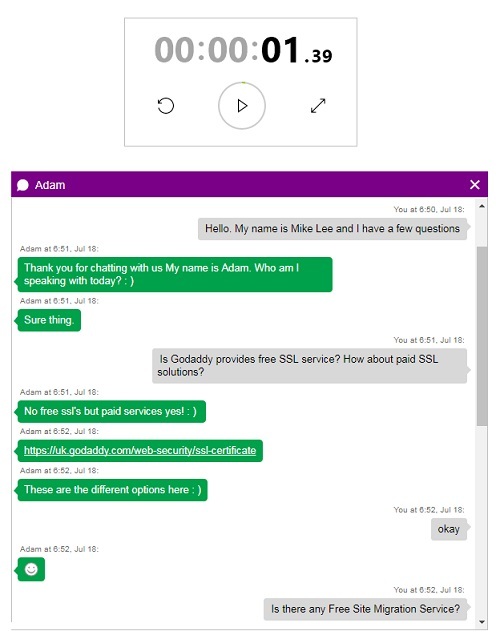 Mike Lee: Is Godaddy provides free SSL service? How about paid SSL solutions? Adam: These are the different options here. Mike Lee: Is there any Free Site Migration Service? Adam: With dedicated servers, yes. But not with shared hosting. Adam: You can do a free auto migration on managed WordPress. Adam: If you have WordPress. Mike Lee: Is Godaddy offers Dedicated IP solution? Adam: Yes, we do.But there are fees in order to do so. Mike Lee: May I know about the charges? Mike Lee: Is Godaddy supports Windows Hosting? If yes then through what type of control panel? Mike Lee: Is Godaddy supports Linux Hosting? If yes then through what type of control panel? Adam: cPanel with Linux. Was there anything else I could assist you with today? Mike Lee: Great. Any Website Builder tool offered? Mike Lee: How about Domain Privacy Protected Service? If yes then free or paid? Adam: A paid service I do apologize. Mike Lee: Is GoDaddy’s Hosting is a part of Endurance International Group(EIG)? Adam: I do not think so I do apologize. Was there anything else I could assist you with today? If you are not ready to set up you can reach back out to us. Mike Lee: What platform is the GoDaddy using to support One-Click installation? Softaculous? Adam: You will need to call our hosting support. Adam: Thank you. Have an amazing day! No need to pay too much attention to the chart, they are just made as a guide. 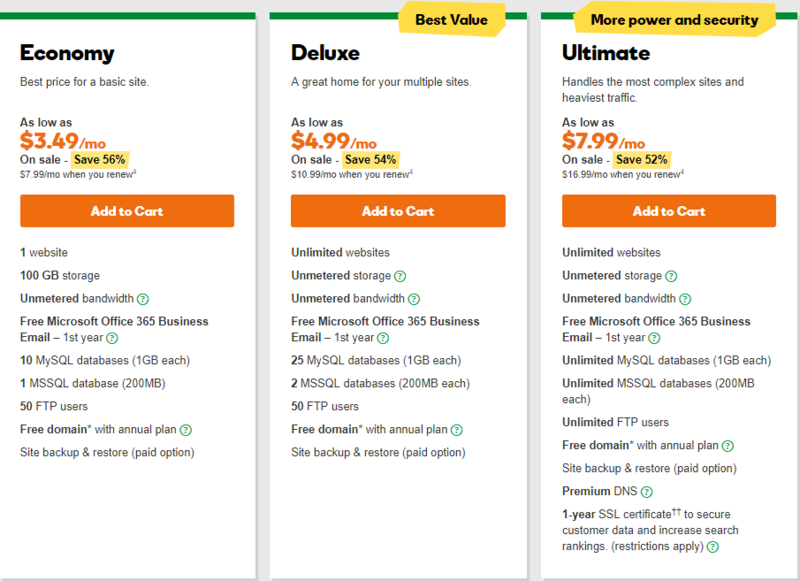 GoDaddy does offer cPanel, but it depends on your hosting plan. Overall, GoDaddy’s control panel is clean, straightforward and easy to manage. GoDaddy claims to have 9 data centers and about 37,000 live servers located around the globe. This is not surprising since GoDaddy is one of the largest web hosting companies in the world. Most websites hosted on GoDaddy that we tested load fast regardless of the viewer’s location. GoDaddy uses OpenStack technology for their cloud services. They give customers outside of United States an option to choose a server closest to them to avoid any latency or data center syncing issues. GoDaddy has decent speeds regarding actual performance. In the past, there were some complaints about the reliability of their web hosting services, but these problems have been resolved since the takeover by the new CEO in 2013. GoDaddy claims to offer 99.9% uptime to their all customers around the globe. 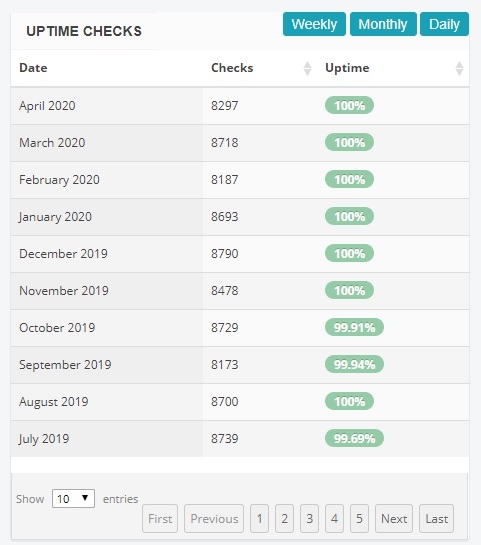 So I wanted to assure by myself and that is why I collected their uptime performance of last 10 month. 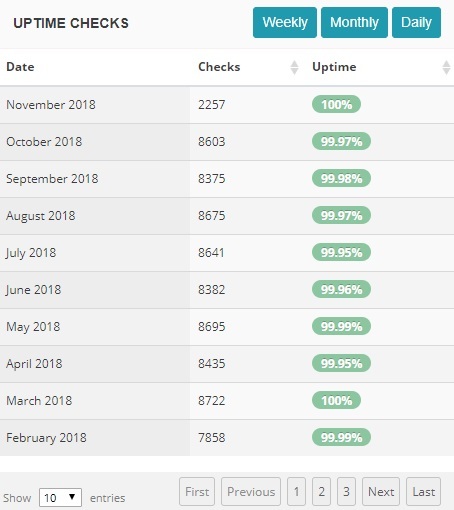 I also uploaded the image of uptime chart and stats to help all those customers who are still confused whether to buy GoDaddy hosting or not. GoDaddy achieved all their target in 10 months out of 10. The overall average of GoDaddy is above 99.90% of all these 10 months. Note: For latest and complete performance of GoDaddy uptime stats, visitors can bookmark our site. When selecting any hosting for your own website, the very first thing that comes to your mind is server speed. If the speed of your website is not fast, then it can create a problem for all the visitors of your website. Same like GoDaddy uptime performance, therefore; I also tested their server speed. I checked one of the website speed which is hosted by GoDaddy from different locations. GoDaddy provides an exceptional server response speed as anyone can see in the attached image as well. Its speed comes with an outstanding rating of A+. GoDaddy is one of the most secured web hosts today. They use “CageFS” technology on their Cloud Linux platform to shield against external attacks. Backups are crucial, and fortunately, GoDaddy does not joke with backups of websites hosted on their server. They do backups and restore it immediately if something went wrong. However, we recommend you do your own backup since GoDaddy only keep limited backups. Huge price variation. Sometimes you will find a lower price, but sometimes it costs more. Summary and Conclusion: Is GoDaddy worth the money? When you are looking for a good domain name registrar, GoDaddy is the best. However, their WordPress hosting needs more features. GoDaddy is a reliable company with the reputation that is hard to ignore. We think that GoDaddy is the best domain name registrar but not the best web host. 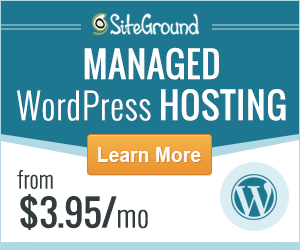 There are better web hosts around, for example, SiteGround and InMotion Hosting. However, they are still a worthy competitor. Their setup process is straightforward, and you will get adequate support when using their platform. Do consider the requirements of your website before rushing into GoDaddy. Compare GoDaddy With Our Top Ranked Web Hosts!